This historical market takes its name from the 16th-century orphanage that used to occupy the site; the red of the children’s clothes indicated that they had been donated by Christian charities. Although the orphanage closed before the revolution, the imposing wooden edifice remained, and was reopened as a deluxe food market in 2000 after extensive campaigning from locals. Now something of a touristic hotspot, the market is equipped to fill the emptiest of stomachs (while emptying the fullest of wallets) with its impressive range of Italian, Lebanese, African, Japanese and other stalls. If a snappy takeaway meal doesn’t satisfy you, there are plenty of artisanal and organic food stalls to fill a few hours of shopping time. One of the more atmospheric of Paris’s food markets. Un endroit sympathique quoique un peu surfait et (trop) bondé le week-end. Cela vaut quand même le détour, car lieu unique dans la capitale. Au cas où vous souhaiteriez vous faire servir, avancer les yeux fermés dans le seul restaurant du marché : un peu onéreux mais produits de très bonne qualité. Quite expensive but a nice hidden spot for eating or buying something good. Love this place - you will want to do several circles around it before deciding on anything. Serious possibility for food envy! 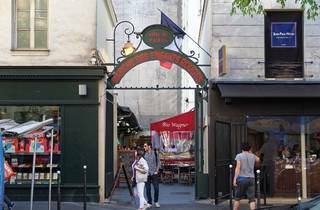 Le Marché des Enfants Rouges, a true wild strawberry spot! Olive oil on an organic ciabatta. Caramelized onions. Mushrooms and freshly sliced avocado. Lightly smoked organic beef and cantal. That is the Recipe of the most delicious sandwich I have ever eaten in my life. It is also the most expensive take-away sandwich I ever bought, 7€. And, it is the longest I ever had to wait in line for a sandwich, or for any "fast-food" take-away for that matter, 50 min! On a positive note I had time to do all my emails, get updated on the latest happenings on Facebook, Twitter, Instagram, Pin-it and get ridiculously hungry. And as my daddy always say "hunger is the best seasoning" The sandwich guy, Edouard, a man in his 60's plays loud jazz music and keeps his stole open longer than anyone else on the market. "mjam mjam" he says laughing every five minutes or so whilst juggling orders in his own anti-stressful pace. No reason to hurry-up, Edouard knows his got the best sandwiches in the city and no one no matter how hungry they might be will leave the line. 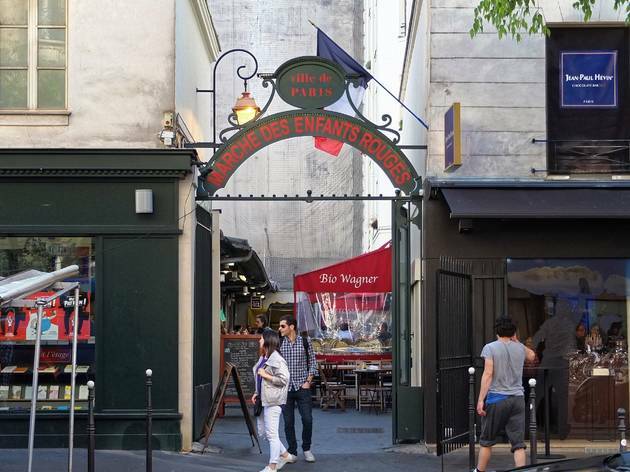 Created in 1615, Le Marché des Enfants Rouges is the oldest remaining market in Paris. "The Market of Red Children" was named after the former neighboring orphanage where its young habitants wore red close a symbol of charity. Simple wooden tables takes up most of the space in between the food-stalls. There are plenty of seats for everyone, but don't expect to find a secluded spot all for yourself this market is all about sharing. Fresh produce, and simply delicious food. Edouard also makes the best crêpes in Paris. I would personally recommend the sucre-citron. Organic flour homemade dough, lemon zest and juice + sugar = a delight.